Beschrijving Dutch & Delisious The Dutch have a rather fascinating relationship with food and drink. On the one hand, they are extremely open to all things foreign. In every Dutch town - no matter how small - you will find at least one Chinese restaurant, one Italian pizzeria and a kebab shop. Supermarkets sell products from India, Turkey, Marocco, Poland, and nowadays sushi is everywhere. At the same time, the Dutch are mighty proud of their own straightforward cuisine, with dishes that refelct their no nonsense attitude: Mashed potatoes with apples and Mash with Carrots and Onions.... The Dutch also love their traditions, and these traditons come with specific treats: Rusks with Aniseed Sprinkles when there is a new baby, Fondant and Speculaas Pieces at Sinterklaas celebrations. Apple Fritters and Oily Balls on New Year's fifty. In this book, you will find recipes for all kinds of special occasions and for everyday meals. 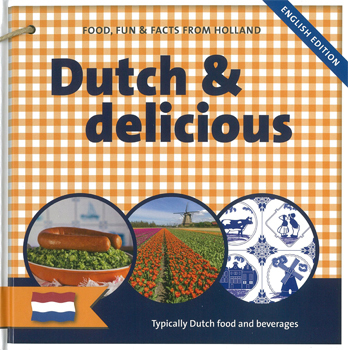 It also contains some interesting facts about the Netherlands and the traditionsof the Dutch. Have fun, or as the Dutch would say: veel plezier!